Discover a new degree of excellence with the H.264 Encoder v2 for Microsoft® Windows®, based on a completely rewritten engine! The current version offers encoding and decoding in highest quality. 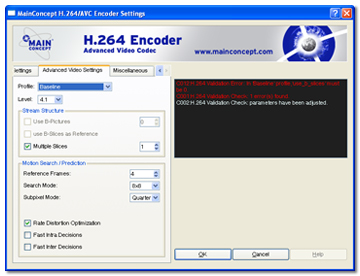 Moreover, the MainConcept H.264 Encoder v2 features extraordinary quality improvement. H.264/AVC (Advanced Video Coding), also known as MPEG-4 Part 10, is poised to be a major video standard because it can replace several popular formats while offering significant advantages over them. Our encoder possesses a simple interface, which resembles that of the acclaimed MainConcept MPEG Encoder. This makes it easier for you to discover the unprecidented efficiency of the new format.